The International Federation of Red Cross and Red Crescent Societies (IFRC) is one of three components of the International Red Cross and Red Crescent Movement – the world’s largest humanitarian organization, providing assistance without discrimination as to nationality, race, religious beliefs, class or political opinions. The other two components are the 189 National Societies and the International Committee of the Red Cross. Founded in 1919, the IFRC supports the 189 member Red Cross and Red Crescent National Societies, through a secretariat in Geneva and more than 60 delegations around the world. In its 1998 World Disasters Report, the International Federation of Red Cross and Red Crescent Societies was one of the first organizations to ring the alarm bell about the catastrophic number of traffic deaths and injuries at the global level, and their dramatic consequences on people and livelihoods. Following this report, the IFRC, the World Bank and the British Government’s Department for International Development (DFID), decided to create the Global Road Safety Partnership to bring together governments and governmental agencies, the private sector and civil society to urgently address road safety issues, especially in low- and middle-income countries, where 85% of traffic deaths and injuries occur, and where numbers continue to increase. The International Federation has identified building a ‘culture of risk reduction and prevention’ as one of its underlying priorities in all its activities. 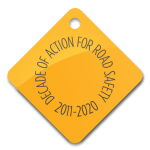 Improving road safety to save lives and livelihoods and build safer communities is part of that policy.